Most people in Muslim countries and the West believe divisions between them are worsening, a Gallup poll for the World Economic Forum (WEF) suggests. The poll also suggested that most Europeans thought more interaction with Islam would be a threat - though most Americans disagreed. 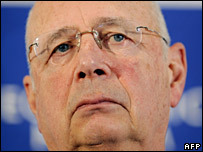 WEF chairman Klaus Schwab said the poll pointed to "an alarmingly low level of optimism" over dialogue. It surveyed about 1,000 people in each of 21 countries, mostly in mid-2007. The annual meeting of the World Economic Forum begins in Davos, Switzerland, on Wednesday. Respondents were asked how they thought relations were now and how they thought they would develop. Describing the position now, majorities on both sides said they did not believe the two sides were getting along. This belief was strongest in the US, Israel, Denmark - where the publication of cartoons about the Muslim Prophet Muhammad caused worldwide controversy - and among Palestinians. WEF experts examining the poll data put this down to the effect of the Iraq war and the Middle East conflict. According to WEF poll, neither the West nor the Muslim world believed the other side respected it. But while Muslims said they believed their world did respect the West, Western respondents agreed that the West did not respect the Muslim world. Looking ahead, the poll paints a somewhat gloomy picture. "In all but two countries surveyed... a majority believed the interaction between Western and Islamic communities is getting worse," said Mr Schwab. Europeans apparently feared more interaction with Islam - according to the report, they saw it as a threat to their cultural identity. 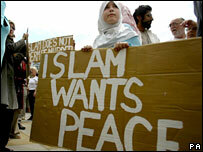 But people in the US, Canada, Israel and the Muslim world said more contact would be a good thing. "Although some might expect the United States, Israel and the Middle East to be more likely than Europe to be threatened by the 'other', the opposite is the case," the report said. The WEF says the report is intended to be the first in a series tracking the state of relations between Islam and the West. Gallup questioned about 1,000 people, mostly between March and September last year, in face-to-face and telephone interviews. The results are published in a report on Muslim-Western relations for the World Economic Forum. Countries polled were Bangladesh, Belgium, Brazil, Canada, Denmark, Egypt, Indonesia, Iran, Israel, Italy, Malaysia, the Netherlands, the Palestinian Authority, Pakistan, Russia, Saudi Arabia, Singapore, Spain, Sweden, Turkey and the US.